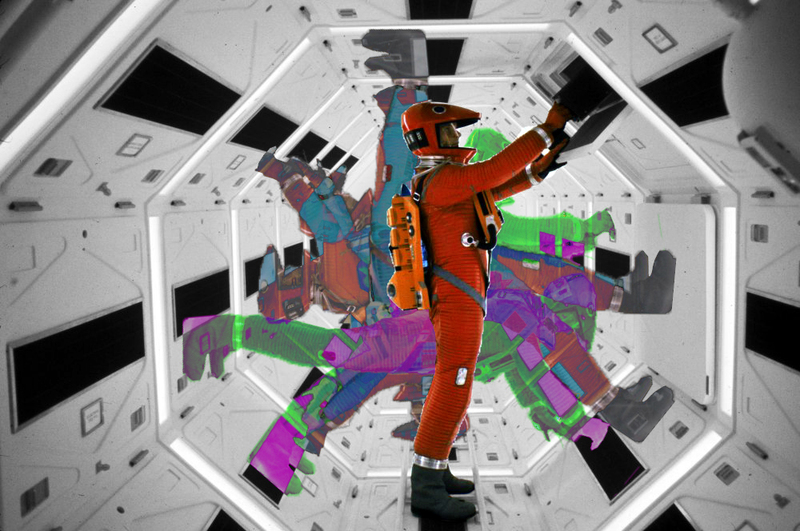 The worlds filmed by Stanley Kubrick are playground for concepts of occupying outer space, and much more. Originally released in 1968, the array of interstellar objects presented in 2001: A Space Odyssey are not the only things of interest. Lacking modern computer technologies, clever schemes were deployed in order to achieve the effects of occupying such environments within space. The concept of creating a “false sense of gravity” while in outer space has been a fantasy for a long time. One of the more realistic approaches utilizes centripetal force, depicted here as the user jogs on a rotating centrifuge of a space. In reality, the user never moves, as the hamster wheel rotates underneath. 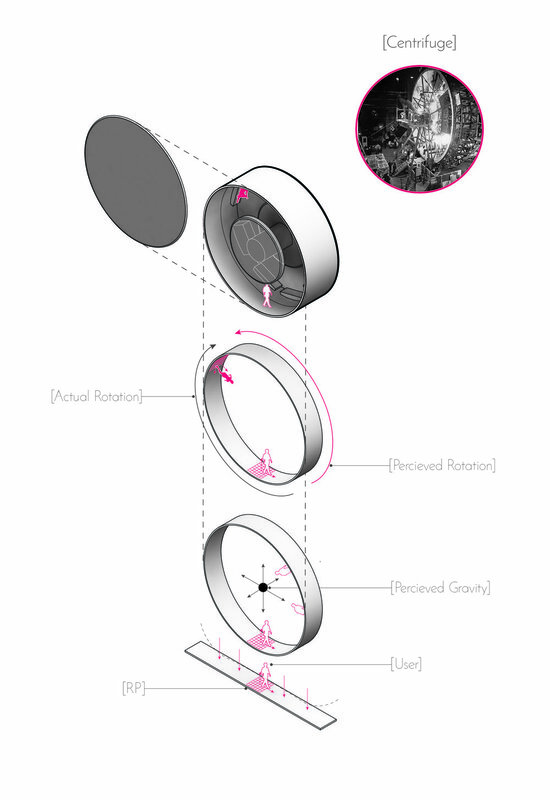 In concept, local orientation is perceived to never change due to gravitational forces, while the very object re-positions the user around itself as it rotates. Through the small windows to the outside, the object is revealed to be also in rotation, and perception of more global changes are allowed. Without these a false ground plane loops upon itself; up and down are becoming relative constants. 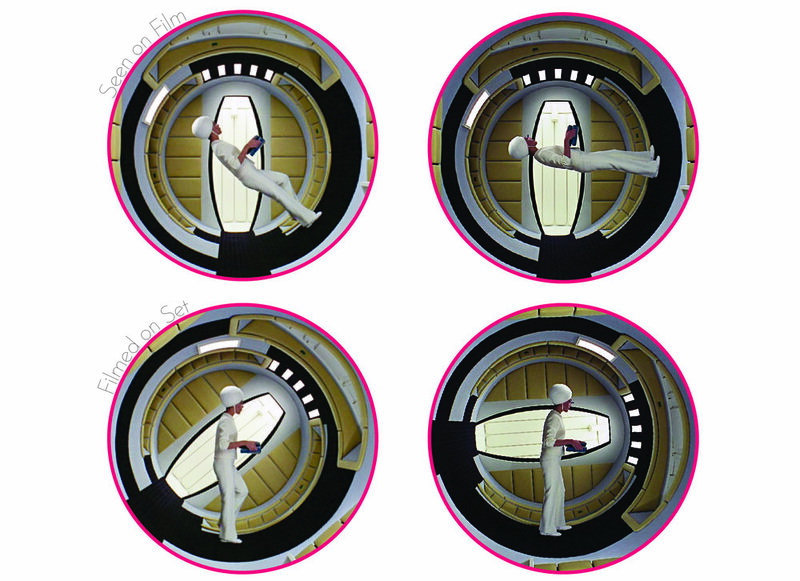 Alternatively in another scene, a stewardess is seen in the film traversing a crossing between two spaces with competing directions of orientation. 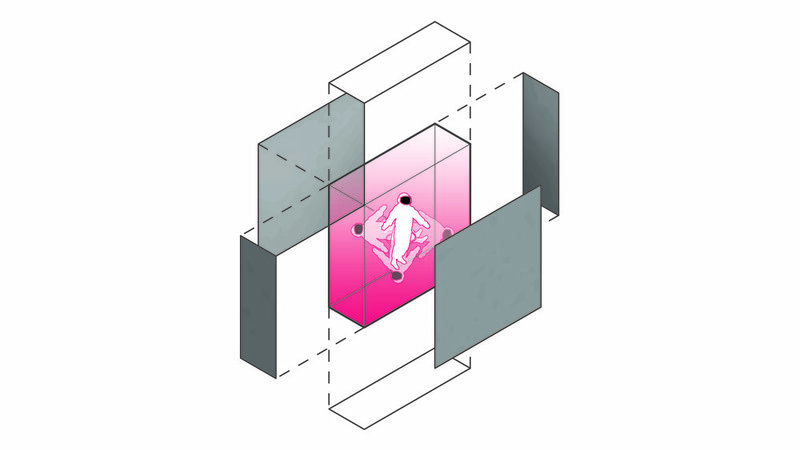 In order to shift from one to the other, she walks perpendicular to a curved surface and into the newly aligned space. This is actually achieved by rotating the space and the camera with it as the user proceeds normally. In concept, there would be no way to tell who is actually doing the rotating because of a lack of exterior reference. These conditions allow for an experimentation of crossing or interacting planes and orientations, but still it relies on a false gravity. This instance of false sense not only has spatial difference and defines interaction, but requires that means of shifting between those planes. Truly the definitive way of relieving such transitions, or avoiding them depending on ones perspective, would be to eliminate gravity altogether. Early in the films depiction of the spacecraft’s interior, overly symmetrical hallways are depicted. Their surfaces entirely covered in compartments and apart from the way in which they open, they imply a certain ambiguity for orientation. These concepts continue to expand when the user reaches the red room (bottom left) where gravity disappears and every surface has a use without an explicit directional orientation other than requiring a single axis being perpendicular. Such strategies have proven useful for zero-gravity inhabitance as seen in the current state of the INST [International Space Station].